Overkill was formed in 1980 from the ashes of the punk band "The Lubricunts", featuring Rat Skates and D.D. Verni (real names Lee Kundrat and Carlo Verni). 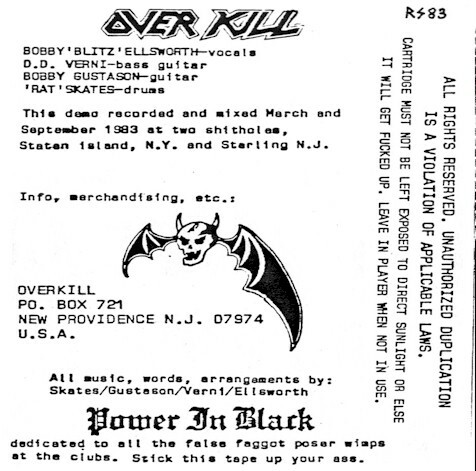 Verni and Skates placed an ad looking for a guitarist and singer which was answered by singer Bobby Ellsworth and the first incarnation of Overkill was formed. After rejecting several names, including "Virgin Killer", the band finally settled on Overkill. In 1981, guitarists Rich Conte and Bobby Gustafson joined the band. At this point, the band started writing original songs, including "Grave Robbers" (later renamed "Raise The Dead"), "Overkill", and "Unleash The Beast (Within)". 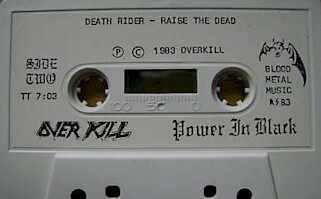 More songs would follow, including "Death Rider" (1981) and "Rotten To The Core" (1982). In 1983 Conte left and Bobby Gustafson remained as the sole guitarist. The band became a staple at New York and New Jersey clubs, such as L'Amours. Around this time, the classic green logo was adopted, which Rat Skates specifically designed to stand out on a poster loaded with red and black logos of the other bands on the bill. In 1983, the lineup of Rat Skates, D.D. Verni, Bobby Gustafson and Bobby Blitz, released the Power In Black demo, a recording that made as much impact in the underground tape trading circuit as demos by up-and-coming Bay area thrash bands like Exodus and Testament. 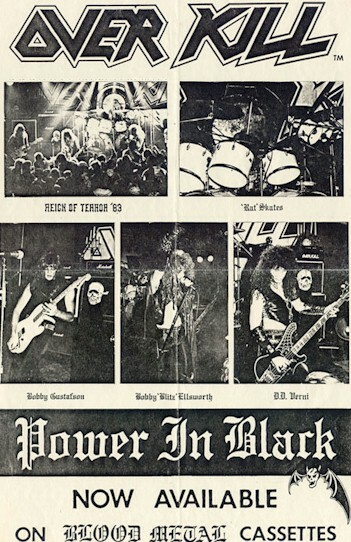 Power In Black gained the band two compilation appearances, 'Feel The Fire' was included on "New York Metal '84" and 'Death Rider' appeared on volume V of the legendary Metal Massacre series. The band was also able to secure a small recording deal with Azra/Metal Storm Records that resulted in the 1984 four track EP Overkill, that quickly sold out, instantly pushing the band to the forefront of the fledgling thrash metal movement. 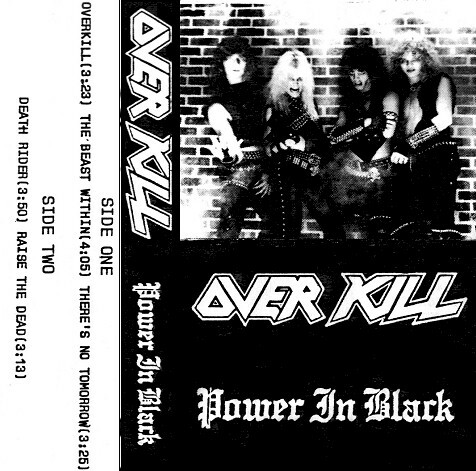 The Overkill EP garnered the band massive underground interest, and the attention of Jon Zazula, the owner of Megaforce Records, one of the most prominent independent heavy metal record labels at the time. Megaforce signed Overkill to a new multi-album record contract and released their full length debut album Feel The Fire in 1985. Recorded in two studio sessions, March and September of 1983. Pro printed covers, no lyrics. Pro tapes w/ stickers on the shell.